The CDC continues to roll out an impressive amount of guidance and research information on the Zika epidemic, and this afternoon has released the following two new MMWRs. Follow the links to read them in their entirety. On January 19, 2016, CDC released interim guidelines recommending pregnant women who had traveled to areas with ongoing local transmission of Zika virus and who had symptoms consistent with Zika virus disease be tested for Zika virus infection. These guidelines were updated and expanded on February 5 to offer Zika virus testing to all pregnant women with Zika virus exposure, regardless of presence of symptoms. As of February 17, 2016, nine pregnant travelers with Zika virus infection from the United States had been identified. No Zika virus–related hospitalizations or deaths were reported among pregnant women. Pregnancy outcomes among the nine confirmed cases included two early pregnancy losses, two elective terminations, and three live births (two apparently healthy infants and one infant with severe microcephaly); two pregnancies (18 weeks’ and 34 weeks’ gestation) are continuing without known complications. CDC released interim guidance for prevention of sexual transmission of Zika virus on February 5, 2016, and updated guidelines on February 26, 2016. 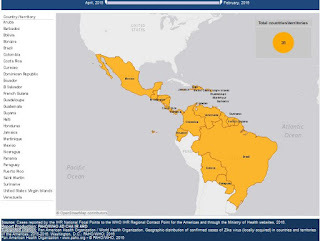 This report provides information on six confirmed and probable cases of sexual transmission of Zika virus from male travelers to female nontravelers.